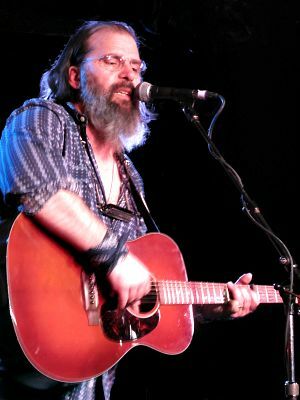 Just about every time that Steve Earle has toured Australia, there has been social unrest in the form of industrial action or political change, giving the leftwing troubadour an opportunity to air his views on the state of the union. Despite there being no such action this time around, other than the Republican primaries in the USA, Steve still was mindful of the dangers of becoming complacent, but did not push it all that hard in his show, singing only two political songs on the night. The show at the Corner Hotel on Friday 30 March was a sell out, and conditions got very hot and steamy as the crowd grew, and at least one person back in the press fainted, causing a brief hiatus in Steve's performance. 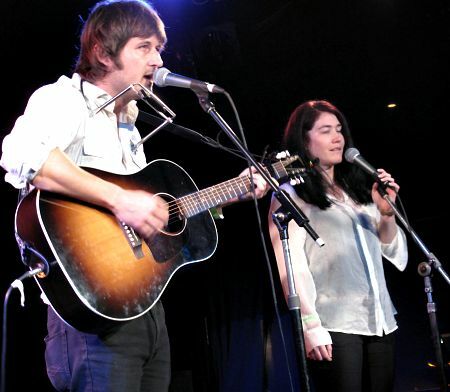 Local Alt Country artist Lachlan Bryan, lead singer and songwriter of The Wildes, opened the show with a short set, singing a number of songs from his debut solo album Shadow of the Gun, as well as Wildes' tune Ballad of a Young Married Man. He was a quality opening act, his song writing being first class with such interesting songs as I'd Rather Sing In Churches (I'm tired of being in bars), Almost Like Saying Goodbye, murder ballad Lily of the Field and Whistle And Waltz where he was joined by Zoe (didn't catch her surname) on the harmony vocals, which on his record are sung by Kasey Chambers. He had some trouble with his ill fitting harmonica neck holder, but soldiered on cheerfully, despite being unable to blow into it. He was obviously delighted to be opening for Steve Earle and confessed himself to be a fan. Steve Earle started his set with a few songs from his latest CD I'll Never Get Out Of This World Alive, Waiting For The Sky, following that with Gulf of Mexico, a tribute to his grandfather which Steve introduced as a sort of sea shanty. Moving chronologically in reverse, to his 2007 album Washington Square Serenade he sang City of Immigrants and Tennessee Blues, then it was way back to his 1986 debut album Guitar Town for My Old Friend The Blues and Some Day. Throughout his set he accompanied himself on guitar, mandolin and an instrument he called a bouzouki - not an instrument to mention while going through customs, Steve advised. It was an interesting set list, Steve performing quite a few songs that I have not seen him do before, or not for a very long time - Now She's Gone from 1996 album I Feel Alright, and Dixieland from bluegrass record The Mountain. I was particularly delighted that he performed Fort Worth Blues, as part of a tribute to Townes Van Zandt, who was of course the young Steve Earle's mentor back in the 1970s. Steve admitted he took some poetic licence with the lyrics for Fort Worth Blues where he wrote "Paris, never was my kind of town", confessing that the opposite was the case. The Townes segment occurred half way through the show, with Steve recalling his mentor with affection, mentioning some story about Townes and a mule he rode over a mountain, saying that when he (Steve Earle) was a young man he thought that it was the coolest thing he had ever heard, and that even now thirty years on at the age of 57, he still thinks it's the coolest thing he's ever heard. He then sang a Van Zandt song, mentioning in passing that even though he had recorded a whole album of Townes Van Zandt songs on his album Townes, this one was not on it. I couldn't identify it by the lyrics, so it was probably an obscurity. Fort Worth Blues, which Earle wrote on hearing of Townes death on New Year's Eve 1997, whilst he was in Ireland. It's a wonderful obituary to his old friend and in my opinion one of Steve Earle's most affecting songs. A rendition of Pancho and Lefty rounded out the Townes segment, with the audience singing along to the chorus. At a Steve Earle concert, the Steve Earle fan is almost as interesting as the artist. They're a mixed bunch, predominately male and friendly, but one young person of the female gender caught the eye up front. The tattooed lady positioned centre front seemed to think she was at a rock concert or something, gyrating to the music and draping her torso over the stage, much to annoyance of the persons standing next to her. The average Steve Earle fan favours punching the air and singing along, rather than dancing. Where I was standing, a number of desperate girls fought their way through the mob to barge into the front stage area. One admitted to me when Steve started popular favourite, Goodbye, that she loved the song and it would make her cry. It did. And another young woman stumbled to the front, looking near to collapse. It was very hot and oppressive as I've said before, and she appeared to be close to fainting, so I imagine being squashed in the crowd would have been very unpleasant. Concerned neighbouring members of the audience offered her support, one even tendering a paper fan, and she eventually recovered her composure and disappeared back into the crowd. Steve played for over two hours and sang, as far as I can estimate, twenty-two songs in all. I wrote down the songs as they were played, but alas my notes are illegible in some instances, hence the incomplete song list. He finished his main set with his sole commercial hit Copperhead Road, but was persuaded back for an encore, which gave him an opportunity to recall the greatness of Woody Guthrie, and how the world needs him and his ilk more than ever, before launching into political hymn Christmas In Washington from 2001 CD El Corazon. It was a great concert and a rare treat to see Steve Earle again in solo mode.